All statistics are from July 1, 2017 to June 30, 2018, except where otherwise noted. Download a PDF of these statistics. The Library welcomed 3.4 million visitors through its doors. By the end of Fiscal Year 2017, 384,450 people were active library cardholders, having used their account within the past two years. In Mecklenburg County's Annual Survey, 66 percent of residents reported using a public library in the last 12 months. Library users borrowed 6,011,818 items. The Library's digital formats were very popular with customers, who circulated 1,325,209 items. The Library encouraged the love of reading and learning by offering 28,962 programs with a total attendance of 398,848. The Library has made a commitment to partner with Charlotte-Mecklenburg Schools to expand literacy programming for pre-third-grade students. Attendance for these library programs was 331,748 participants. 1,421 volunteers contributed 53,386 hours of service in libraries. 12,352 people used computers in the Job Help Center and experienced 334 Job Help-themed programs. Library customers expressed satisfaction with library services at the rate of 98 percent, an increase of almost 2 percent from FY2017. 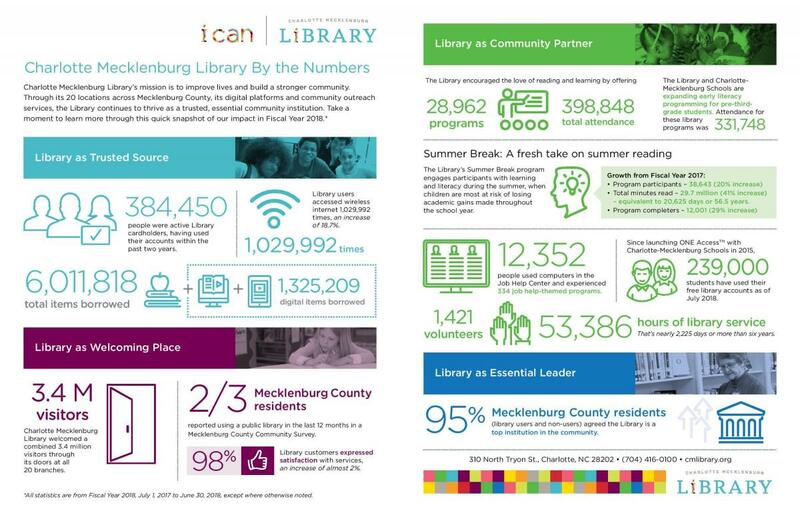 In Mecklenburg County's Annual Survey, 95 percent of residents (Library users and non-users) agreed the Library is a top community institution. The Library's Summer Break program engages participants with learning and literacy over the summer, when they’re most at risk of losing academic gains made throughout the school year. Summer Break encourages kids to participate in a variety of activities over the summer, in addition to reading.